Exotic tonewood pairing enhanced by special bracing and equipped with solid electronics - all at an affordable price. Taylor's 300 Series has introduced countless players to the pleasures of the all-solid-wood acoustic experience; it's the entry point to Taylor's USA-made instrument line. Players who step up to a 300 Series instrument, like this 322ce 12-Fret V-Class Grand Concert left-handed acoustic-electric guitar, will be rewarded with a guitar-for-a-lifetime that will only sound better with age. It doesn't take but a few strums to learn how the mix of tonewoods, construction and appointments combine to make Taylor's famous playability, intonation and tone. The 300 Series has everything you need and nothing you don't need in a fantastic sounding and playing instrument. 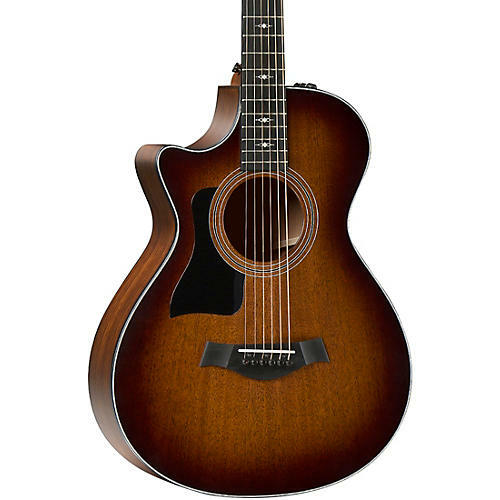 The 322ce 12-Fret V-Class Grand Concert left-handed acoustic-electric guitar ships in a deluxe hardshell case made by Taylor for optimal fit and protection. Like what you see? Order today and you'll enjoy years of great Taylor tone.